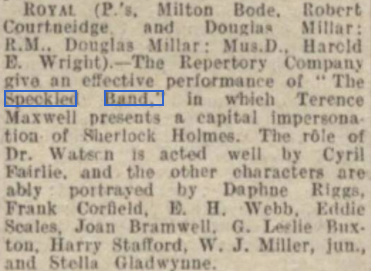 Greta Wood was in the cast of Sir Arthur Conan Doyle's "The Speckled Band", at the Theatre Royal, Barry, and the Theatre Royal, Bristol, in 1927. From The Stage - Thursday 26 May 1927. Terence Maxwell played Sherlock Holmes. From The Western Daily Press - Tuesday 24 May 1927.